! Gold Coast 1875. Specimen Stamp. YT#16. €100.00 !
! Gold Coast 1875. Stamp. YT#3. €100.00 ! SG 158 - corner block of 4 with plate number. GOLD COAST - 1950. INCLUDES SG. 74a, 76, 97(creased), 98. AS PER SCAN. Queen Victoria-Edward VII Examples. GOLD COAST. REST OF WORLD (UPTO £40) £3.00. Part Album Page. Unique Item ID: IA23548. UK RECORDED (UPTO £100 TOTAL) £2.00. UK ORDINARY (UPTO £40 TOTAL) £1.00. Topics: Royalty - King Edward VII - Perfin. 1900 10/- Green & Brown. GOLD COAST. MOUNTED MINT. UK 2ND CLASS (UPTO £40 TOTAL) FREE. UK RECORDED (UPTO £100 TOTAL) £2.00. 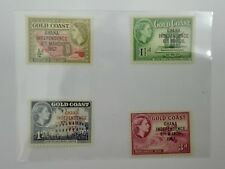 Gold Coast 1948 KGVI set complete MLH. SG 135-146. Sc 130-141. Gold Coast 1948 KGVI set complete mint lightly hinged. Gibbons # 135-146. Scott # 130-141. MNH EXCELLENT, CLEAN UNMOUNTED MINT. GOLD COAST SG23 1889 10/= DULL MAUVE & RED. A FINE MOUNTED MINT (MINT HINGED) STAMP. Gold Coast 1891 1 1/2d Postal Stationery Card Cape Coast Castle to London. Did marking such a card 'Urgent' make a difference ?! Add to Favourites. Good Used : Small imperfection(s). Superb/Fine Used : No faults. GOLD COAST - 1907/13 EVII WMK.MCA 5/- GREEN & RED/YELLOW OVPT. REST OF THE WORLD - £2.00. ALL MINT NEVER HINGED WITH ORIGINAL GUM. THERE IS ONE TRACE OF HINGE ON THE SIDE MARGIN. SG 48 Gold Coast 1902. £1 purple & black/red. mounted mint CAT £190. SG 48 Gold Coast 1902. mounted mint CAT £190. Country: Gold Coast. Catalog #: 130-141 (complete set). • Any faults such as thins, tears or pinholes that are not obvious from the picture are described above. Condition: Mint, Light Hinge. The cert states vertical bend. NO INTEREST | NO CATCHES | NO SMALL PRINT. REST OF WORLD. INTEREST-FREE CREDIT OPTIONS UK Personal Cheque. Gold Coast SG 143/6 top values of 1948 GVI set. Fine lightly mounted (hinged) mint. (SG Cat - £81). Mounted (hinged) mint. (SG Cat - £275). Gold Coast 1889 QV 10s dull mauve & red MLH. SG 23. Sc 23. Gold Coast 1889 QV 10s dull mauve & red mint lightly hinged. Gibbons # 23. Scott # 23. SG 34 Gold Coast 1898-1902. Very lightly mounted mint CAT £225. Gold Coast 1948 KGVI. Complete set of 12. MLH. SG 135-146. Gold Coast 1948 KGVI. Complete set of 12. SG 135-146. MLH/MM (etc) - a mix of MLH and MM with the majority being MLH. MLH - Mint Light Hinged - lightly hinged no hinge remainders. Gold Coast 1884-91 set SG11/19b MLH/MM cat £180 - 2s has a single light toned perf. SG 34 Gold Coast 1898-1902. A pristine fresh very lightly mounted mint example CAT £225. GOLD COAST KGV Scott 98-107 SG103-112 Mint Lightly Hinged fresh set. Catalogue Value £110. 1907 - 13 KEVII KEY TYPE 5/-. BRITISH COLONIES & TERRITORIES -------------------------------------------------------------------JUBILEE 1935 -- SILVER JUBILEE GEORGE V - OMNIBUS 1935 ---------------------- OMNIBUS SET JUBILEE 1935 --.